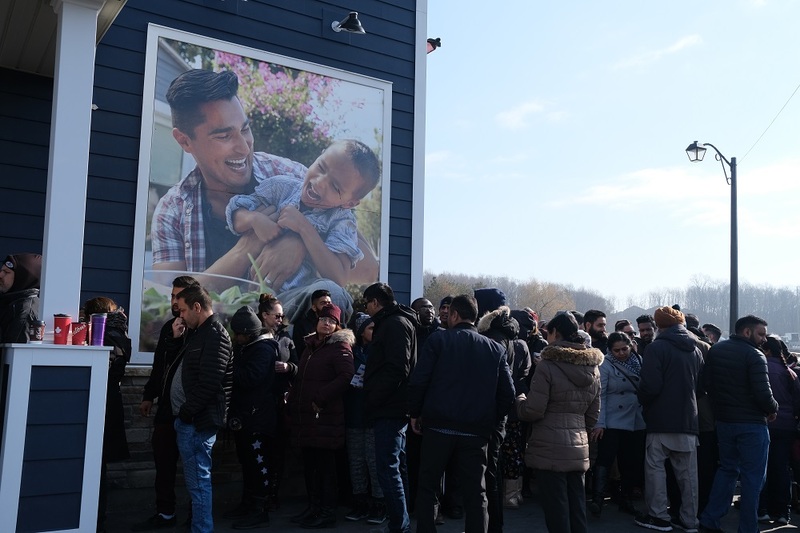 Days before the opening, prospective purchasers took it upon themselves to create a list, and even took attendance every few hours to ensure the line-up was fair and operated on a first-come, first-served basis. Some people put their names on the list as early as the Wednesday before the Saturday opening in order to be among the first to enter the sales centre! Leading up to the Grand Opening, eager home buyers attended our pre-purchase info sessions, which we hosted at the sales centre. 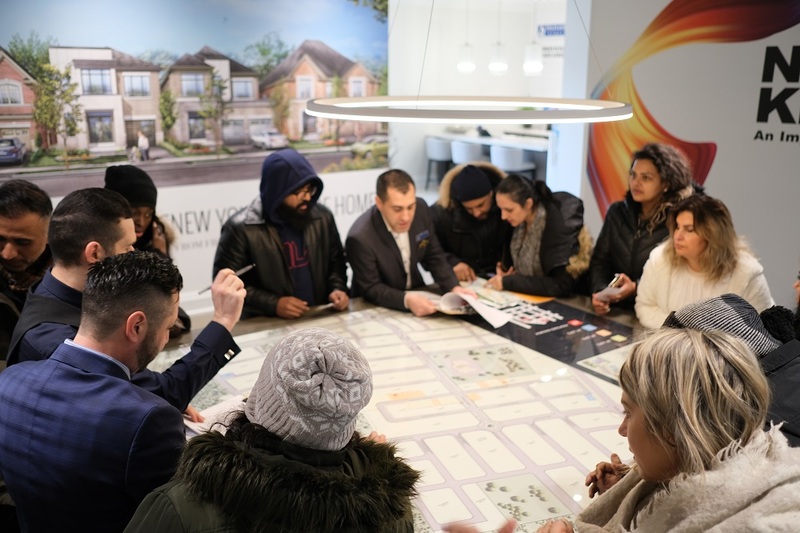 The info sessions had all the info they needed in order to make a purchasing decision on opening day, so it wasn’t surprising to see some buyers sitting down to sign their Sales Agreements almost as soon as they entered the sales centre. On the morning of the Grand Opening, the parking lot filled up quickly. Even a few of our Fieldgate staff ended up parking on Hwy 27 and had to walk to our sales centre! As soon as 10 am struck, we opened the doors to the first 10 groups. Limiting the amount of people in the sales centre made it so everyone was able to comfortably gather around the site table and browse the available lots. It also allowed our sales representatives to assist everyone in a casual manner. New Kleinburg features 38’ and 44’ detached homes, and we had a limited selection of 30’ detached homes. Over the weekend, we sold all of the available homes in this release! We do however have a selection of inventory Impressions homes available, all of which are 4-bedrooms and more than 3,200 square feet. Our Kleinburg sales centre at Hwy 27 and Major Mackenzie Dr. West will be open 11-7pm this week (closed on Friday). 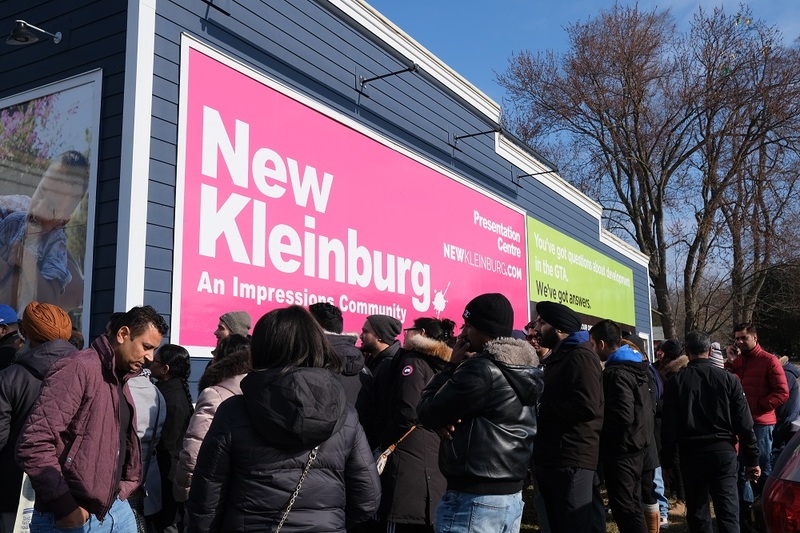 Thank you again to everyone who came out to our New Kleinburg Grand Opening and helped make it a huge success!